Poems are wonderfully evocative. With just a few lines, a poem evokes an image, a memory, a possibility, or a feeling. When I recall Robert Frost’s “two roads diverged in a yellow wood,” Bruce Cockburn’s “If I had a rocket launcher,” and Earle Birney’s “David,” I readily picture autumn leaves; I imagine righteous anger; I feel inner horror. Recently, I read a poem by Angeline Schellenberg that has stayed with me for several weeks, because of what her honest words evoke. This Labour Day weekend, I stand at the doorsill of a New Year’s fresh routines and commitments, projects and deadlines. 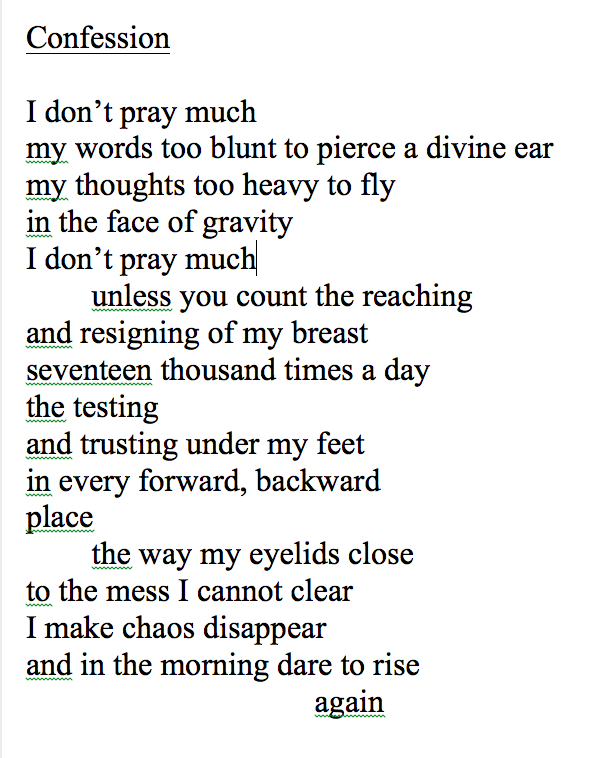 Among my many checklists, I find myself asking, “How do I pray—and not pray?” But rather than grading myself on the basis of someone’s spiritual checklist, however inspirational that may seem, I suspect it would be more fruitful to consider my praying in light of what Angeline’s poem evokes. Something in me rises warm when I read this poem. I’m not alone. I’m not the only one who struggles to pray. I’m not the only one whose prayer-words seem dull and ineffective. In the face of the world’s twenty million refugees and cancer’s random assaults and the impenetrable motives of people I know, I “do not know how to pray as we ought.” I could easily join another poet, who laments that “the world is too much with us.” On the other hand, perhaps this state of affairs is an excellent place from which to begin praying, because this is the place of realizing that I’m not good at praying. So I feel relief. And relief opens me to possibility. Finally, if honesty helps me learn, and if my breathing connects me with our Creator, then the daily act of daring to rise may be my prayer of hope. As September propels me into work and bewilderment, joy and impossibility—my own and the world’s—placing my feet on the floor each morning is an initial prayer of faith, risk, and love—because of the One whose faithfulness is new every morning. What does “Confession” evoke in you? Please write a comment below. For those who’d like to read more about “praying the ordinary,” I recommend chapter 15 in Prayer: Finding the Heart’s True Home by Richard Foster. This is the most inviting book about praying that I’ve ever read. Foster introduces a host of ways to pray—from simple prayer to radical prayer, from tear-filled prayer to healing prayer. This entry was posted in Uncategorized on September 5, 2015 by adyck1.